Whether you seek to express yourself, recreate your favorite work of art, or show appreciation for your loved ones, nothing beats a tattoo! 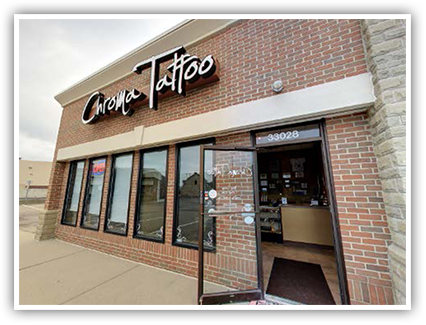 Chroma Tattoo has the skills and expertise to give you the ink of your dreams, from the simplest symbols to the most elaborate, colored images. We operate out of West Bloomfield, serving clients in Farmington Hills MI and the Metro Detroit area. No matter what designs you have in mind, we can bring them to life. Never underestimate the power of two simple colors! Using just black and grey, our team can create any number of beautiful designs. We have the skills to carefully vary the shade of grey, adding depth and distinction to the image. We can also extend or edit these tattoos at any time, so that you can build on the design and make it increasingly elaborate. Whether you have a specific idea of what you want your tattoo to look like or just want to lay down some general guidelines, the Chroma team listens to all your desires and follows them to the letter. Our goal is to turn your specific desires into a reality, allowing you to achieve the exact look you seek. Between our extensive training and more than seven years of experience, we have no trouble producing the custom designs you're looking for. The Chroma team specializes in hand-drawn tattoos, recognizing that there is no better way to achieve unique, memorable designs. We are so committed to this method that we don't even have tattoo flashes on our walls! When you visit our tattoo shop, you know you're getting something special. Browse through some of our reviews from satisfied customers. We proudly serve clients in West Bloomfield and Farmington Hills Michigan and the surrounding areas. "Would recommend anyone to go here to get any tattoos done (and piercings) I've personally have been going to Karlos for a couple of years now working on a sleeve, but recommend any of the artists there. The owner and other members are all outgoing and friendly. It really makes someone whose anxious be able to relax. Very calm environment and if you're anything like me and ask a million questions everyone there is patience and will answer them all." Proper care is critical after you've received a tattoo. Without it, you could suffer skin irritation and/or changes in skin texture! For this reason, the Chroma Tattoo team spares no effort during the aftercare stage. We make sure that the tattooed area and surrounding skin are completely clean and administer a bandage to protect your skin and prevent the ink from staining your household items. We then give you instructions on how to remove the bandage, wash the tattoo, and apply any necessary ointments. By tailoring our advice to the specific size, shape, and location of the tattoo, we help you heal quickly and completely, so you can enjoy your new ink to the fullest. 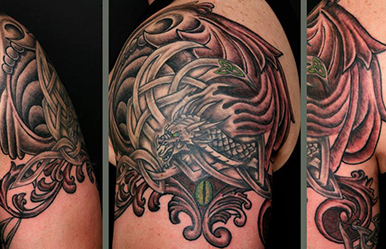 For more information on tattoo services near the Farmington Hills MI area, contact Chroma Tattoo today.